If Facebook can be any sort of indicator, it can be surmised that at least a half-a-million people or more plan to participate in Chick-fil-A Appreciation Day by visiting one of the national chain's restaurants today. However, the numbers of people buying a chicken sandwich and waffle fries today could be far greater because of support from influential Christian leaders including evangelist Billy Graham. Inspired by former presidential candidate Mike Huckabee's plea to express solidarity with the restaurant following the fallout over gay marriage, the buildup toward the day included social media chatter of biblical proportions. "We're simply asking people to eat chicken and not to be one when it's time to take a stand – our appreciation is not only for the views of Dan Cathy, but for his right to have them and express them freely," stated Huckabee on the Facebook page he created for the event. In the often times bitter online debate, even some Christians are asking, "What's the point of it all?" "Know what's funny? 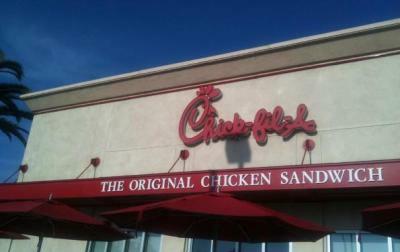 This act by Chick-fil-A has done nothing but anger the gay community," commented Becky under one of Huckabee's posts. "Aren't we as Christians supposed to be good stewards of the word? Has this reached the gay community in a loving way, or a judgmental way?" Chick-fil-A has made a deliberate move to try and steer clear of the controversy first started when the company's president, Dan Cathy, affirmed his belief in traditional marriage, or the "biblical definition of the family unit." 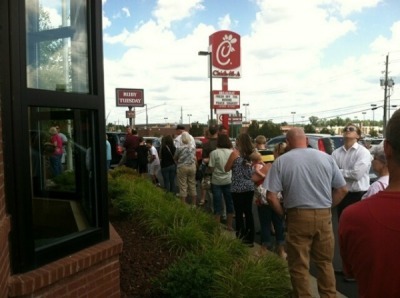 As people in the East consider having a Chick-fil-A meal today, reports are coming in of high traffic at the restaurants. Donna writes on Facebook: "Chick-fil-A in Anderson, SC is so full that they are having to direct traffic!!!!" "We will be there to say thank you for taking a biblical stand," Barbara comments. "There is no Chick-fil-A franchise anywhere near where I live, but I bought a shirt online to show my support for Mr. Cathy. There is only one Chick-fil-a store in Wisconsin (Racine), but Wisconsin Family Council is collecting donations to buy chicken dinners at the Racine store for those standing in line," Bette writes on Facebook under a Huckabee post. While some media outlets scrambled to deliver the first reports on the state of business during Chick-fil-A Appreciation Day, TV station WYFF 4 out of South Carolina reported, "There was a large crowd at the Chick-fil-A in Greenville during lunchtime on Wednesday. One supporter had a sign that read, "Support Chik fil a for supporting family values!"